The combination of chicken and yogurt is really tasty. It is nice and tangy flavor of blended yogurt. 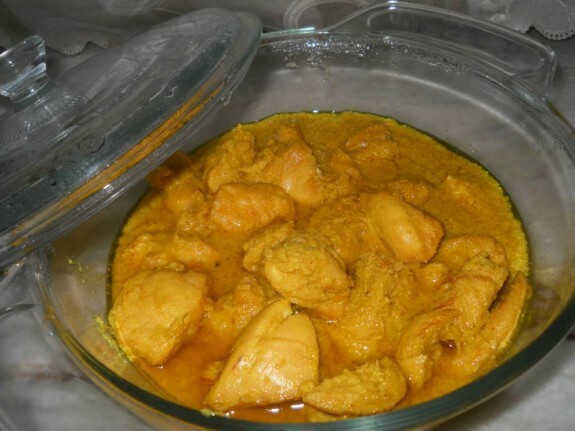 This recipe is also known as Doi Murgi in Bengal. Try this famous yet easy to cook recipe in your home. 1. Take a big bowl and put all the chicken pieces. Now add curd, ginger garlic paste, green chilly paste, red chilly powder, turmeric powder, coriander powder and salt with the chicken. Mix it well. 2. Put a lid and keep the marinated chicken at least for 1 hour. 3. Now heat oil in a pan. Add onion thin slices on the pan. Sauté it for 2 mins. 4. Add rest amount of garlic paste and stir it well. After that add the marinated chicken and mix it well. Cook for 4-5 mins, at the mean time you have to stir the chicken continuously in high flame. 5. After 5 mins, add warm water and cover it to cook properly. 6. After 10 mins checked whether the chicken cooked or not. (In between you have to remove the cover and stir 2-3 times). 7. If it has been cooked then remove it from the flame and serve it with rice.